During my years as editor, I have enjoyed a great many facials, but the ‘’Rejuvenate,’ available from Lakewood Organic Beauty is unique. Not because the products are organic, although that in my opinion is a definite advantage, but because this facial offers a touch of rejuvenation from the moment of arrival. 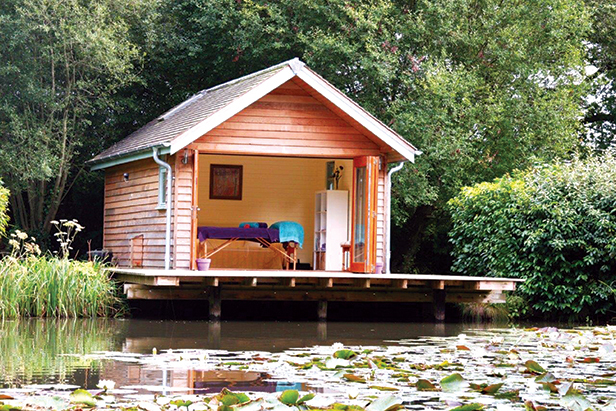 After refreshing myself in a luxury cloakroom, it was a pleasure to be taken by Kate Denning across a vast expanse of garden to a boathouse beside a lake. Once inside, it became apparent that Lakewood provides a little piece of heaven. The clean and airy modern wooden building was warm with plenty of natural light and has a comfortable sofa and a treatment couch. In the summer, the doors can be opened onto the lakeside bringing nature even closer. Soothing music doesn’t detract from the birdsong and with squirrels foraging and fish kissing the surface of the water there is an overpowering feeling of tranquillity. Kate told me it is not unknown for deer and rabbits to roam the grounds and kingfishers to flit across the lake. Kate has lived at Lakewood in Fordingbridge for seven years and says, “It is such a beautiful setting that I wanted to share it. I am also mindful of the products that we put onto our skins and decided I could offer organic facials in lovely surroundings.” And this is precisely what she does. Having qualified as a therapist in 2012, she chose to use Neals Yard Organic products, which are gentle on the skin and are available to order if required. After a thorough consultation, I lay on the couch and Kate ensured that I was snugly covered and comfortable. A warm towel was used to open the pores on my face, soften the skin and help me relax. Then followed a double cleanse with calendula followed by frankincense. A rose facial polish was used to lift dead skin cells and smooth the skin. A face and neck massage with almond oil took in the upper arms and top of the chest and was really soothing. Then came the frankincense refining mask and while it was working its magic, Kate gave me an arm and hand massage with bergamot and garden mint lotion. A white tea eye gel was applied, as well as a wild rose beauty elixir and to finalise the treatment Kate applied almond moisturiser. I was left in the tranquil setting whilst Kate went back to the house to make me a cup of mint tea from fresh mint leaves. The ‘Rejuvenate’ facial really lives up to its name and I left feeling refreshed and ready to tackle the rest of the day. To book this or one of the other unique facials at Lakewood Organic Beauty call Kate on 07789 650018. Gift vouchers are also available for special occasions like birthdays and Mother’s Day. If you choose a Replenish or a Rejuvenate facial there is currently £5 discount, see the advert for details. Do bear in mind that a short walk is involved, but that is all part of the memorable Lakewood experience.